The popular GIMP image editor has been updated to version 2.8.12 with a lot of bug fixes. Here is how to install or upgrade it in Ubuntu 14.10, Ubuntu 14.04, Ubuntu 12.04 and their derivatives. 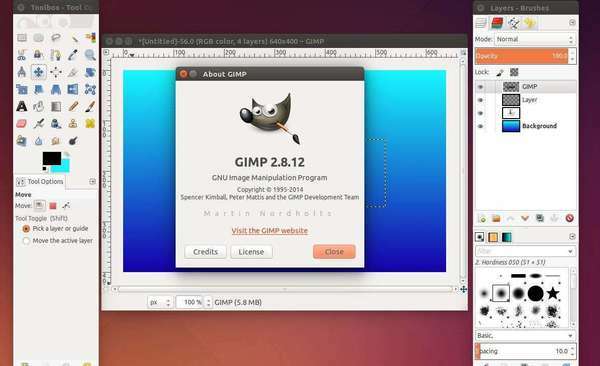 GIMP, GNU Image Manipulation Program, is a raster graphics editor used for image retouching and editing, free-form drawing, resizing, cropping, photo-montages, converting between different image formats, and more specialized tasks. Make script-fu-server more secure by listening to 127.0.0.1 by default and add a warning about changing that IP. This breaks the procedure’s API, but for security reasons. 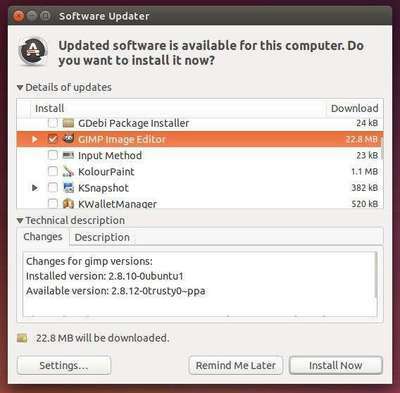 GIMP packages are available in PPA for all current support Ubuntu releases, Ubuntu 14.10, Ubuntu 14.04, and Uubntu 12.04. It works great. Much appreciated!!! finally i succeeded use GIMP in uv texturing,, thanx!!! Thanks Ji. Works great. The screenshots were helpful too. For other users: if apt-get shows you an error like this one: “0 upgraded, 17 newly installed, 0 to remove and 236 not upgraded.” then just run apt-get again and it will download the necessary files.